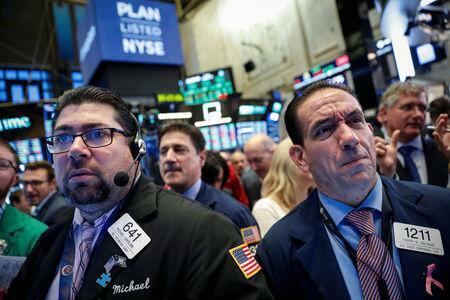 NEW YORK (Reuters) - Major stock markets slipped on Monday as rising tensions between Western powers and Saudi Arabia added to concerns over the pace of global economic growth, with investors flocking to traditional safe-havens like the Japanese and Swiss currencies, as well as gold. Oil prices rose as the Saudi-West rift more than offset concerns over slowing demand for oil in the long term. The yen touched a one-month high versus the greenback and the Swiss franc rose for the fourth session in five while gold hit its highest since late July. Saudi Arabia's King Salman on Monday ordered an internal probe into the unexplained disappearance of Jamal Khashoggi as a joint Turkish-Saudi team was expected at the Saudi consulate in Istanbul where the journalist and dissident was last seen on Oct. 2. The kingdom is preparing a report that would admit Khashoggi was killed as the result of an interrogation that went wrong, CNN reported, citing two unnamed sources. Turkish police have audio showing Khashoggi was killed at the consulate, sources told Reuters. Over the weekend, prominent business people including JPMorgan's CEO Jamie Dimon and Ford Chairman Bill Ford canceled plans to attend an investor conference this month in Saudi Arabia, the world's largest oil exporter. U.S. crude rose 0.48 percent to $71.68 per barrel and Brent was last at $80.76, up 0.41 percent on the day. "If the Saudis don't come to the rescue when the Iranian sanctions kick in... it's going to be a very under-supplied market. That was the fear that was initially driving prices higher," said Phil Flynn, an analyst at Price Futures Group in Chicago. On Wall Street, major indexes were mixed, with defensive sector stocks rising after soft retail sales data. Apple was among the largest drags after a warning from Goldman Sachs regarding overall consumer demand from China. The Dow Jones Industrial Average <.DJI> fell 89.44 points, or 0.35 percent, to 25,250.55, the S&P 500 <.SPX> lost 16.34 points, or 0.59 percent, to 2,750.79 and the Nasdaq Composite <.IXIC> dropped 66.15 points, or 0.88 percent, to 7,430.74. The pan-European FTSEurofirst 300 index <.FTEU3> rose 0.20 percent and MSCI's gauge of stocks across the globe <.MIWD00000PUS> shed 0.45 percent. Emerging market stocks lost 0.86 percent. MSCI's broadest index of Asia-Pacific shares outside Japan <.MIAPJ0000PUS> closed 1.11 percent lower. Japan's Nikkei <.N225> slumped 1.9 percent. Washington said it would seek a provision about currency manipulation in future trade deals with Japan. The dollar softened against major currencies after the weak U.S. retail sales data for September while Treasury yields were little changed after hitting last week their highest level in over seven years. The euro rose 0.14 percent to $1.1578. The Japanese yen strengthened 0.37 percent versus the greenback at 111.78 per dollar, while Sterling was last trading at $1.3151, down 0.02 percent on the day. The Swiss franc rose 0.47 percent versus the greenback at 0.9866 per dollar. Turkey's lira jumped 1.6 percent to its strongest since mid-August after Trump cheered the release of a U.S. pastor who had been under house arrest in Turkey. Investors hope his release can lead to an improvement in strained U.S.-Turkey relations. Saudi Arabia's riyal currency was still testing the boundaries of its peg at 3.7514 to the dollar - its weakest spot rate since June 2017. Benchmark 10-year notes last fell 5/32 in price to yield 3.1576 percent, from 3.141 percent late on Friday. Last week, the U.S. 10-year yield reached 3.261 percent, which was last seen in May 2011, while the 30-year yield hit a four-year peak at 3.446 percent. "The market will likely settle into its new range after the volatile trading of the past couple of weeks," said Boris Rjavinski at Wells Fargo Securities in New York. Likely pressuring yields higher, U.S. data showed the federal government closed the 2018 fiscal year $779 billion in the red as tax cuts hit revenues and the government paid more to service a growing national debt. Spot gold added 0.7 percent to $1,226.29 an ounce. U.S. gold futures gained 0.64 percent to $1,226.40 an ounce.